COLUMBUS — New research from AAA reveals that clouded or yellowed headlights reduce the amount of light produced by nearly 80 percent. Since adequate lighting is critical to driving safely in the dark, this dramatic reduction in light puts drivers at risk. AAA urges drivers to check their headlights for signs of deterioration and take steps to improve visibility. Most headlights are made of plastic, and exposure to sunlight breaks down the plastic coating, causing discoloration that blocks the light. Depending on the amount of sunlight exposure, headlights can begin showing signs of deterioration in just three to five years. Since the average age of cars on the road today is 11.6 years, discolored headlights are common. Previous AAA research found that, even when new, halogen headlights fail to safely illuminate unlit roadways at speeds as low as 40 mph. High beams don’t offer much improvement. Even the most advanced headlights tested illuminated just 40 percent of what could be seen in full daylight. “Headlights on the road in the U.S., even when new, don’t produce a sufficient amount of lighting, so any reduction in performance is a real safety issue,” said Greg Brannon, AAA’s director of Automotive Engineering and Industry Relations. To understand the impact deteriorated headlights have on nighttime visibility, AAA conducted research using an accredited laboratory to test headlights from two popular sedans, approximately 11 years in age. Results from the degraded headlights were measured against new headlights to quantify the amount of light produced for each. Replacing headlights with original equipment manufacturer parts is the most effective method to restore light output back to 100 percent. Replacing headlights with aftermarket parts restored light output between 83 and 90 percent, and was more likely to produce glare for oncoming traffic. Professional and DIY restoration returned light output back to about 70 percent, but also produced glare. AAA recommends drivers routinely check for signs of discoloration, such as yellowed or cloudy appearance. 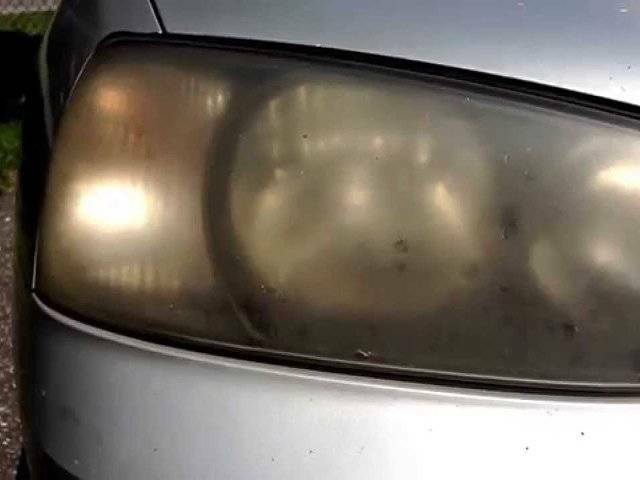 If it’s difficult to see the bulb through the lens, have the headlights replaced or restored as soon as possible. Replacement is best, since it offers the most improvement, but the other less expensive methods also work fairly well, and may be more reasonable for drivers on a budget.